My son & I just returned home from a wonderful trip to visit my aunt, uncle and two of my cousins....some of my favorite people in the whole world! We took a few cookies along with us, so here's a look at batch #1. 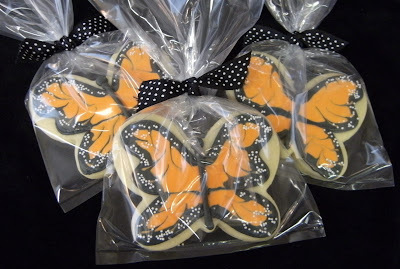 These monarch cookies were for my Aunt Janice. I am so, so happy that my uncle had the smarts to marry her! :) I'll bet that every one of my friends knows "Aunt Janice" because I frequently talk about her...she is one cool cookie! Switch the tip on the black icing bag to a #2 and pipe the outline of the wings. Run a rubber spatula through the icings to pop any bubbles that formed on the top. Pour into 2 separate squeeze bottles. Using the thinned black icing, follow the outside edge of the wing outline. Immediately fill with thinned orange icing, filling in the remainder of the wing, making sure the black and orange icings meet. 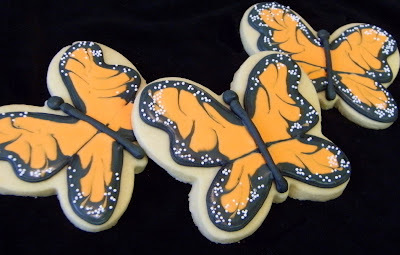 Using a toothpick, drag the black icing into the orange, making veins in the wings. While the icing is still wet, drop on white non-pareils. Let the wings dry for an hour or more. 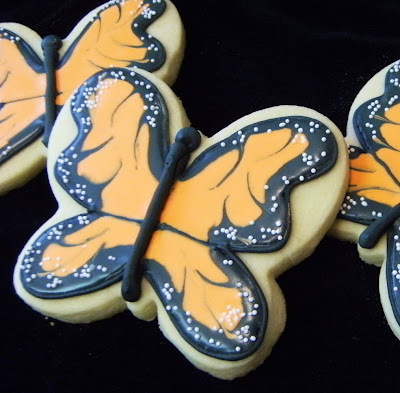 If desired, go back over the butterfly body using a #5 tip in black icing. I love the final look, too, with the ribbon...it gives it the finishing touch. These cookies are beautiful! Thanks for leaving me a comment on my blog today. Not only did it brighten my day (I LOVE getting comments) but it lead me to your most amazing blog. I almost fell off my chair when I saw these cookies! They are almost too beautiful to eat. They are amazing! You rock! They WERE almost too beautiful to eat. But I'm glad I did eat them because they tasted amazing. Thanks, Bridget! You need to post picts. of the others, too. Julia...your blog is awesome! It is one of my favorites that I have saved in Google Reader! :) Thanks for the sweet comment! These cookies are amazingly beautiful! You are so talented! I love the white dots! Adorable! these butterflies came out just beautiful! These are beautiful, too pretty to eat! First time I've seen these butterflies done by you. They are absolutely beautiful Bridget. Beautiful. I actually made some of these. They came out great. I wish I was more creative and could come up with the ideas! Your blog is inspiring. Your cookies are a work of art. Absolutely gorgeous. Bridget your work is just amazing ... these butterflies are gorgeous.